You may be surprised to read that one of the world's most popular community fish has appeared on this list when surely they are angelic? 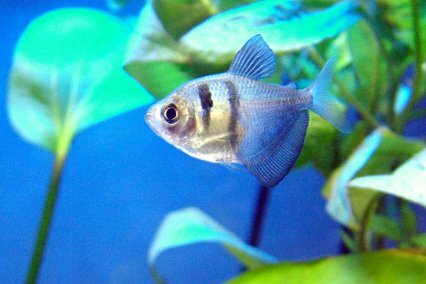 Not so, as these cichlids grow large, eat small fish like Neon tetras and become aggressive and territorial when breeding. Red tail black sharks and Ruby sharks are strikingly coloured and provide movement lower down in the aquarium, but their territorial tendencies can drive them (and you!) mad, as they constantly chase and stress your other fish. Silver sharks are peaceful but grow to over a foot in length, are skittish, and will eat small fish like Neon tetras. Common plecs and Gibbiceps are good algae eaters but grow way too large for the average aquarium at 45cm/18". They also leave long strings of poo everywhere, get caught up in and uproot your plants. 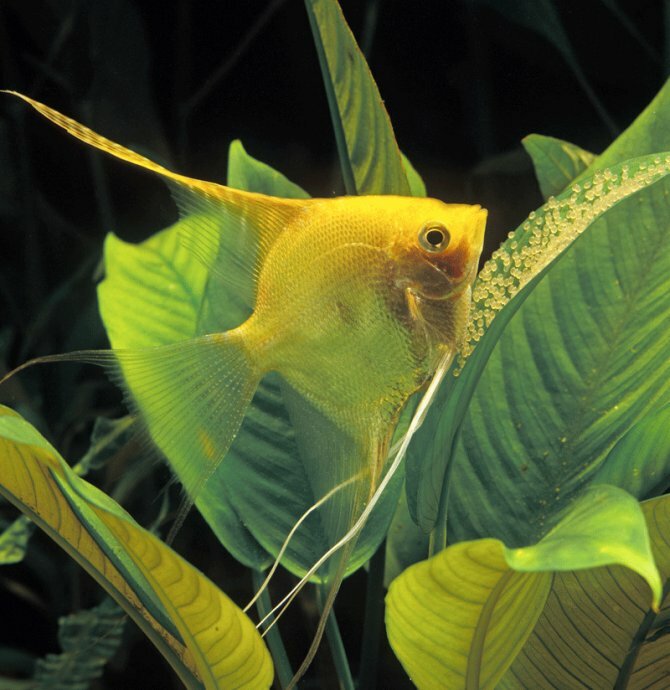 Golden nuggets (above) are high on the wish list of many, but they hide, can get very large and aggressive and are short lived in the average aquaria. 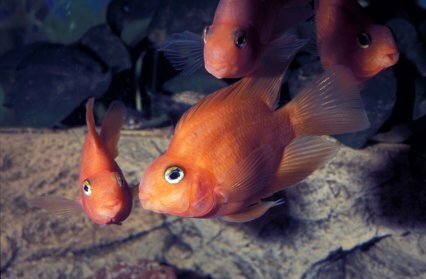 These Severum/Midas cichlid crosses are popular because of their intelligence and cute faces, yet can grow to over 25cm/10" in length, eat small fish, get gravel stuck in their deformed mouths and lay sterile eggs everywhere. As killifish go this species is a non-annual, hardy and easy to keep, but they grow to over 7.5cm/3" in no time at all and then go around eating all your smaller fish. They may look small and colourful but these fish are highly predatory, and hence best left out of all except a community of medium sized fish upwards. Before you hang up your net for the last time and take up pottery instead, not all tetras are bad, just some. Serpae tetras, Blue tetras, Black widows (above), White spot tetras and Red eye tetras may all nip the fins of other fish, as do the unassuming Blind cave fish. Black widows also grow quite large, turn from black to grey and become territorial towards each other too. Being natural inhabitants of warm, shallow ditches, our power-filtered aquaria have too much flow for the poor little fighters. 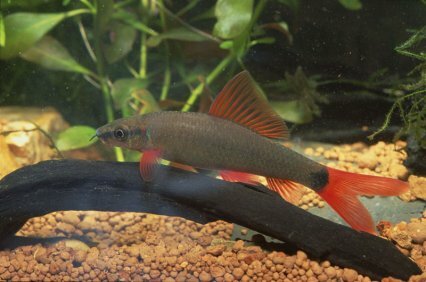 Their fins become targets for nipping, and they themselves may pick on male guppies, thinking they are other fighters. These hardy catfish look all too tempting when small, with the Striped doras looking like a tank full of humbugs in the shop. Often bought as snail eaters, both species rapidly grow to 15cm/6" plus, stuff themselves away all day so you never see them, and may eat small fish at night. 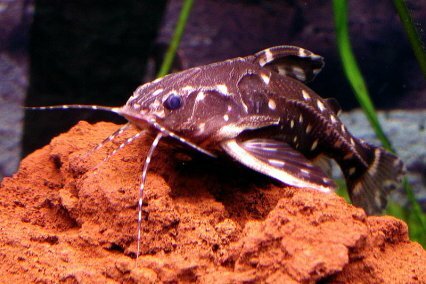 Another wonderful looking catfish, and we love them, yet they need lots of swimming room, company of their own kind, and will eat small fish. Couple that with the fact that are only available wild caught, and usually pick up a nasty dose of whitespot after arriving. 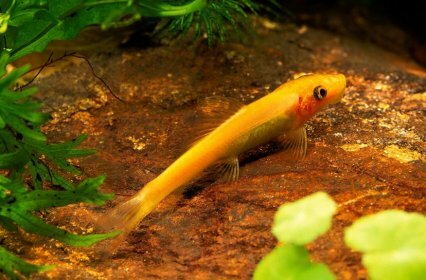 The Chinese algae eater or Sucking loach (Gyrinocheilus aymonieri) is a tireless, hardy algae eater when small but, and this is a big but, it grows to over 15cm/6" long (30cm/12" in the books) and can become very territorial. The result? Two thirds of your tank will be beautifully clear of algae but also of fish, as they all cower in the opposite corner. The golden form (pictured above) is particularly popular with unwitting hobbyists.